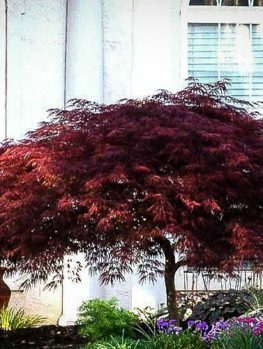 The Mikawa Yatsubusa Japanese Maple is a miniature variety that grows just 3 or 4 feet tall in ten years. It is the perfect specimen for a natural bonsai tree, or it can be grown in the garden or in a planter box. It fits perfectly into the smallest space, and if you have a tiny, Asian-themed garden or terrace, this is the ideal choice for a tree. With its exquisite green leaves, like tiny hands, it grows naturally in a tufted fashion, making it look mature and graceful even when young. After a few years you will have an evocative miniature tree, without the detailed work needed to turn other trees into bonsai. If you want a small tree for any partially-shaded spot in your garden, then this is the ideal choice. In fall, it will turn spectacular shades of yellow and red, bringing fall color to the smallest garden. 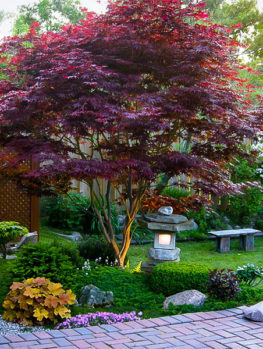 Plant the Mikawa Yatsubusa Japanese Maple in a spot that has morning sun, but light shade for the rest of the day. It will grow best in acidic or neutral soil, and it should be watered regularly, especially in the first few years. It has no significant pests or diseases, and it is easy to grow with minimal care. If you crave those miniature trees, but don’t have time for detailed care, then this tree is the ideal choice to make. It is rarely available, so this is an unusual opportunity to grow something very special, yet easy to care for. Everyone is enchanted by those miniature Japanese trees called Bonsai. Many people are put off actually trying to grow them, because they hear how difficult it is to create those perfect miniature forms. Japanese Maples are particularly beautiful as bonsai, because they have such graceful foliage, with leaves that are already small and in scale for a bonsai tree. 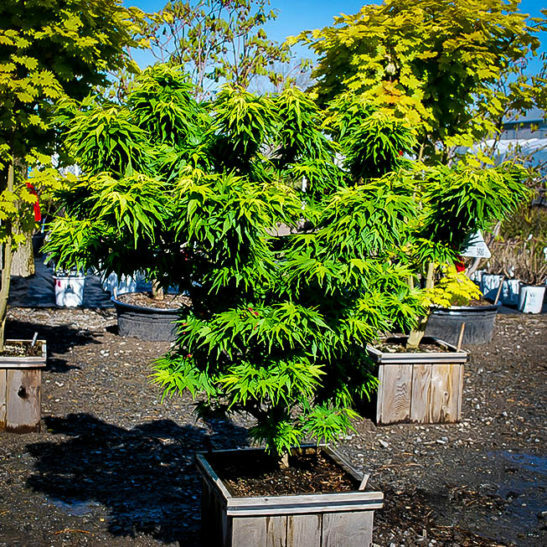 Most varieties still need significant pruning and training to create a suitable dwarf form, but there is one, the Mikawa Yatsubusa Japanese Maple, which is considered by experts to be the perfect bonsai maple. It naturally grows into a compact, dense form, and needs almost no work to become the perfect miniature tree. After 10 years it will still only be around 3 feet tall, and if grown in a container it will be significantly smaller. The beautiful leaves grow in dense tufts, staying close to the trunk, and it forms a beautiful miniature tree with no work from you, and no special training needed. 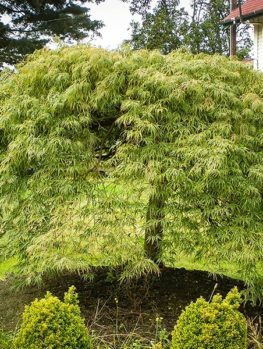 Of course, you don’t have to grow this tree just as a bonsai, and if you have a very small garden, then this is the perfect small bush to create a wonderful effect, without overgrowing even the smallest spot. If you have planter boxes, then along with other smaller shrubs, this is an ideal choice for a complete miniature garden. 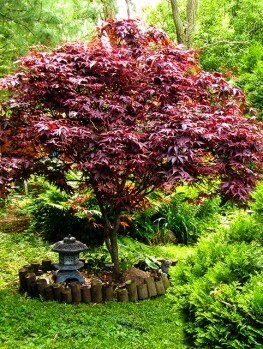 However you grow it, you are sure to fall in love with the Mikawa Yatsubusa Japanese Maple, and enjoy it in your garden. 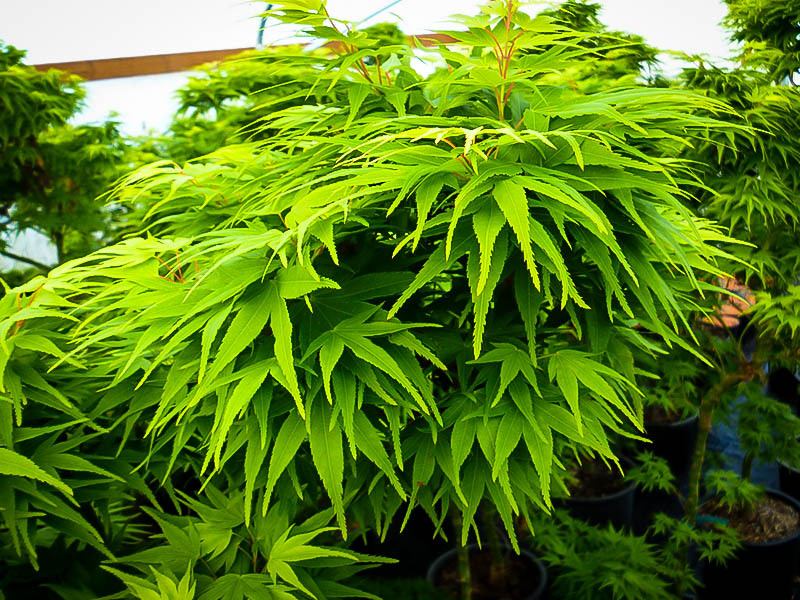 The Mikawa Yatsubusa Japanese Maple has beautiful tiny leaves, spread out like the fingers of a hand, and the 5 to 7 narrow lobes are cut deeply towards the central stem of the leaf, tapering to a delicate point. The foliage is a rich green, turning brilliant shades of bright yellow and powerful red in fall, creating a dynamic effect and competing even with the beauty of sugar and red maples. It grows slowly into an upright tree, 3 or 4 feet tall and around 2 or 3 feet wide. It even produces tiny red flowers and small red seed pods, that decorate the tree in winter, looking like miniature versions of the familiar maple keys seen on large maple trees. The smooth, gray trunk is a perfect backdrop to the naturally-dense clusters of leaves. 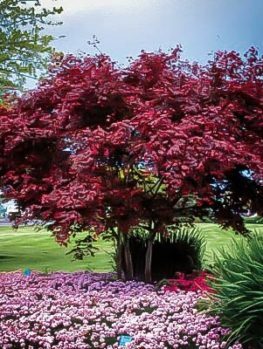 Grow your Mikawa Yatsubusa Japanese Maple in a partially-shaded location, preferably with protection from the hot midday and afternoon sun. Plant it in rich, well-drained soil that does not become too dry, and water it regularly, especially when it is young. Add rich, well-rotted organic material to the soil when preparing the planting spot, and mulch each spring with similar material, to protect the roots from drying out, and to feed the tree. Cover all the root-zone, but do not touch the trunk. To grow this tree in a container, choose one with drainage holes, and use potting soil for acid-loving plants. Traditionally, bonsai trees are mulched with living moss, and if you can find some growing in a shady spot in a local forest, it can be lifted from the soil easily in a piece, and then laid over the soil of your pot. Dry moss can also be crushed and sprinkled like grass seed on damp soil, where it will quickly become green again. Use half-strength liquid fertilizer every month during spring and summer. If necessary, trim your tree in early spring, before the new growth appears, and always trim back just above one of the pairs of buds you will see on the stems. 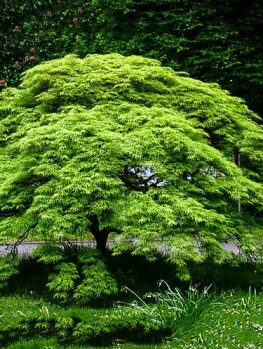 The Japanese Maple (Acer japonicum) grows naturally in woods in Japan, Korea, Manchuria and eastern Russia. Unusual forms of this tree have been collected and treasured in Japan for many centuries, and the art of growing bonsai dates back thousands of years. Valuable trees are passed down through the generations. The Mikawa Yatsubusa Japanese Maple originated as part of a wild tree found in the Tōkai region of Japan. This area used to be part of an older province, called Mikawa, and that is the origin of the name of this variety. Yatsu busa means ‘eight tufts’, drawing attention to the dense, tufted branches that distinguish this variety. 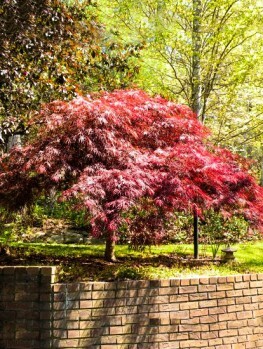 This unique tree was found in the 1970s, and first grown in America by the Japanese Maple expert J. D Vertrees, whose Maplewood Nursery in Oregon had the largest collection of Japanese Maple Trees in America. 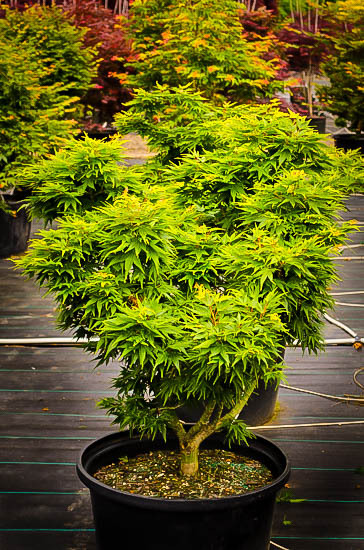 This variety is known to be especially difficult to reproduce, and it must be grown from stem pieces skillfully attached to the roots of seedling trees. Only very skilled and dedicated craftsmen have the patience and ability to do this. 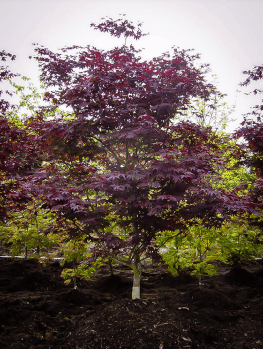 Because we are known among Japanese Maple growers as specialists in these trees, The Tree Center has been privileged to receive a few of these very special plants produced by expert growers. These unique and beautiful ‘natural bonsai’ trees will not be in our stock for long, so high is the demand for this variety, so order now, before they all go.